- A curious blend of Gaelic and Mid-eastern, this cross has genuine camel bells which chime softly with each passing breeze. A colored glass gem glows in the heart of the cross. Lovely on a porch or balcony. Sorry, this item has been discontinued. 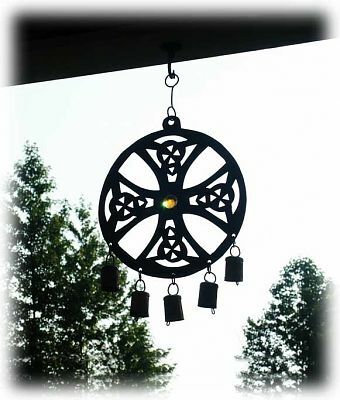 Do you have any other questions about our Celtic Cross Wind Chimes? This was bigger than I expected, and has a really nice sound. Perfect!